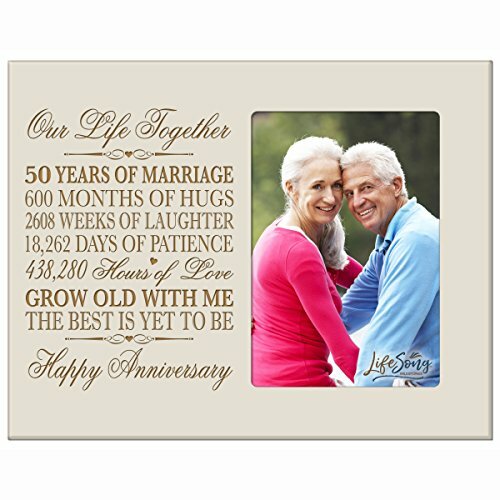 Honor the happy couple with a 50th wedding anniversary photo frame. A treasured and lasting personal keepsake for wedding or anniversary. 50th Anniversary picture frame can be hung on wall or displayed on table. This special keepsake anniversary gift will always be a wonderful reminder of the love that you have for one another. Honor the happy couple with a 50th wedding anniversary decorative wood photo frame holds 1- 4x6 photo. Words are laser engraved. If you have any questions about this product by LifeSong Milestones, contact us by completing and submitting the form below. If you are looking for a specif part number, please include it with your message. Bombay Distressed Cream and Brown Frame, 4 by 6"